The Makai's dedicated Golf Concierge makes it easy to book Golf Groups tailored to your groups specific requests, including room, greens fee, cart fee, and tee times at any of our beautiful golf courses. 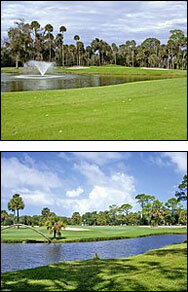 Take a moment to view some of the incredible golf courses in the Daytona and Ormond Beach area. 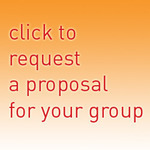 Why choose the Makai for your golf group? We know Daytona Beach golf. Golf Concierge on staff that works with all the courses in the area. LPGA International sets the standard of excellence, offering challenging courses, quality service and immaculate conditions. The Champions Course, designed by Rees Jones, opened in July 1994 and for five years played host to The LPGA Titleholders Championship. At 7,088 yards from the back tees, this course features strategic mounding, tranquil marsh areas, nature preserves, and numerous lakes and bunkers. Full clubhouse amenities include a complete lunch menu and group outing banquet facilities. Voted Best Golf Course in Daytona Beach 2000 and 2001. Dress Code: Collared shirts; no jeans, cutoffs or tanktops; soft spikes only. The Legends Course, a championship design by Arthur Hills, has hosted the ADT Season Ending Championship, Florida State Golf Association Championships, NCAA Championship and annually hosts the LPGA Qualifying School. This spectacular layout provides the perfect balance of power, finesse, and fun. With tight, well-bunkered greens, undulating fairways and abundant hazards, this 6,984 yard layout requires strategy on each of the 18 holes. Noted designers Arthur Hills and Mike Dasher laid out this course amid the cypress forest and natural Florida wetlands, with great care for the land. Although the site is relatively level, the mounding and contours give players a feeling of elevation. Fairways are tree lined, and there are plenty of water obstacles. Superb conditioning and beautiful wetland settings make this a course you will want to play again. Dress Code: Collared shirts; no denim; soft spikes only. Come enjoy a unique golfing experience along the scenic Old Dixie Highway! Located near historic Bulow State Park, Halifax Plantation Golf Club was designed by highly respected golf course architect Bill Amick. The 7,128 yard course was created to excite the average golfer while challenging the expert with its choice of five elevated tee boxes and trapped, pristine greens. Century-old oaks and pines surround the picturesque fairways, expansive driving range and putting greens. The staff's personal attentiveness to individual and group needs ensures a pleasurable golfing experience for all. Golf Packages are available. The north course was designed and built by Slim Deathridge in 1946. Lloyd Clifton re-built the course in 1997. All greens, bunkers and tees were redone. The result is a very challenging golf experience that winds its way through dense Florida Oak and Pine, undulating greens and more water in play than the adjoining South Course, making for an enjoyable round. The South Course is the original 18 holes designed by Donald Ross is 1921. Tee shots are very forgiving, but the approaches are demanding if you want to get it close to the flagstick for a birdie attempt. Florida oaks, elevated greens and little water are great features of this course. Dress Code: Collared shirts; appropriate length shorts; soft spikes only. The Club at Pelican Bay is located in Daytona's premier gated community, and features two championship golf courses, the North and South Course. Each winds around sparkling waterways and lush foliage. The courses welcome any golfer at any level, for an unforgettable golf experience. Nestled within 300 acres of woodlands and uniquely situated along the historic Tomoka River, River Bend is a 6,281-yard, par-72 championship course. Acclaimed architect Lloyd Clifton has achieved a perfect combination of natural surroundings with competitive and scenic golf course layout. River Bend is designed to use every club in the golfer's bag, and features signature holes such as #8, the longest par-5 in the Halifax area at 616 yards! Preservation of the environment is a priority at River Bend, where Florida's significant wetlands bordering the Tomoka have been carefully protected. Separation of the holes by the wetlands required environmental boardwalk crossings that are both beautiful and functional.